I like to wander, particularly when I am somewhere new and I want to learn about it. I like to immerse myself in the culture of a community, to learn how the natives live, and to blend in as much as possible. So, with that philosophy, I went about finding the places the people of Brussels frequent, the back-alley, ancient pubs people have been drinking in since before the United States existed. My scouring of these back-alleys is how I came to drink in the 400-year-old bar called Au Bon Vieux Temps (which roughly translates to ‘in the good old days’). This place is the real deal. You don’t get more authentic than this hidden gem. To find it you have to be very lucky. First you have to be patient enough to check the myriad alleys that are around every corner and in odd places. These alleys – sometimes barely wide enough for one person to fit down – are everywhere. And, in my limited experience in Belgium, the absolute best bars are located down these alleys. All you have to do is wander down them. Now, I know what you are thinking, is it safe? Actually, surprisingly enough, it is. 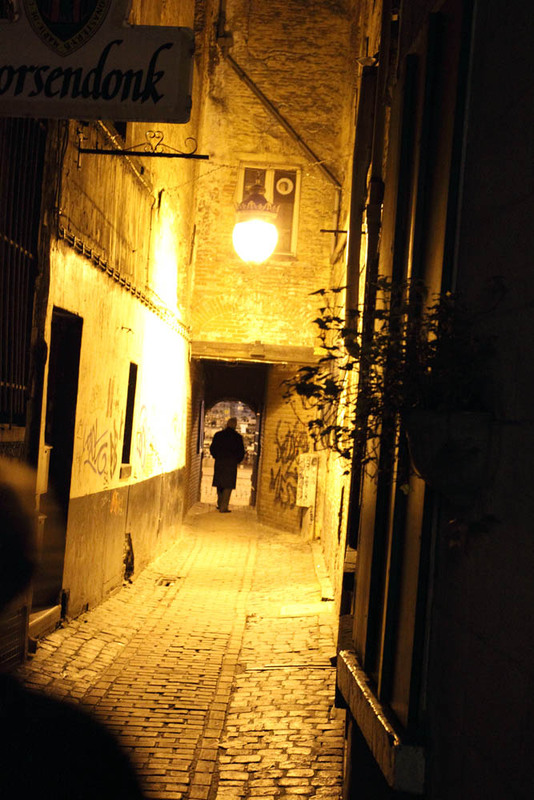 The alleys are clean, well lit, and only marginally scary looking. Au Bon Vieux Temps is nestled in the corner of one of these alleys. I almost passed it because a sign on the door mentioned something that my very poor French translated as bathrooms outside or something of that sort. I actually thought that it was a bathroom or storage room of some sort. But, being the intrepid soul I am, I pulled on the door and revealed a beer-lover’s wonderland. The interior of this paradise is warm, rich wood paneling complimented by copper and brass coat hooks and antiques lining a shelf just below the ceiling. Above the paneling the walls are painted a mustard yellow (dark mustard, not French’s mustard) and a large wooden bar forms an “L” shape to the left. A large fireplace complete with ancient and ornate coal heater sits just past the bar. On one wall a wooden carving of a pontiff looks down upon the happy patrons and on another a wooden Madonna surveys all. 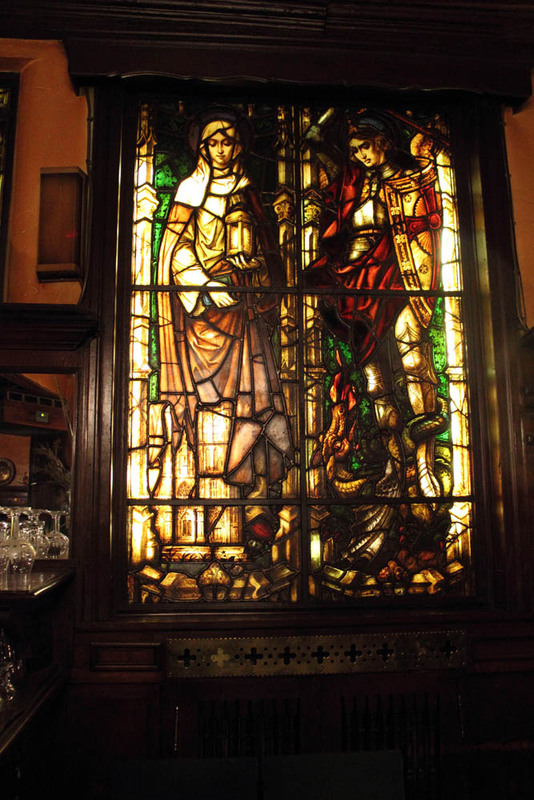 But, most impressive of all, are the stained glass windows. On the wall facing out to the alley are two windows, artistic mosaics of bubbled clear glass, and colored squares. On another wall is a window depicting a knight and maiden in stunning color and artistry. Breathtaking as the bar itself is, it is the people the make this bar so enjoyable to visit. 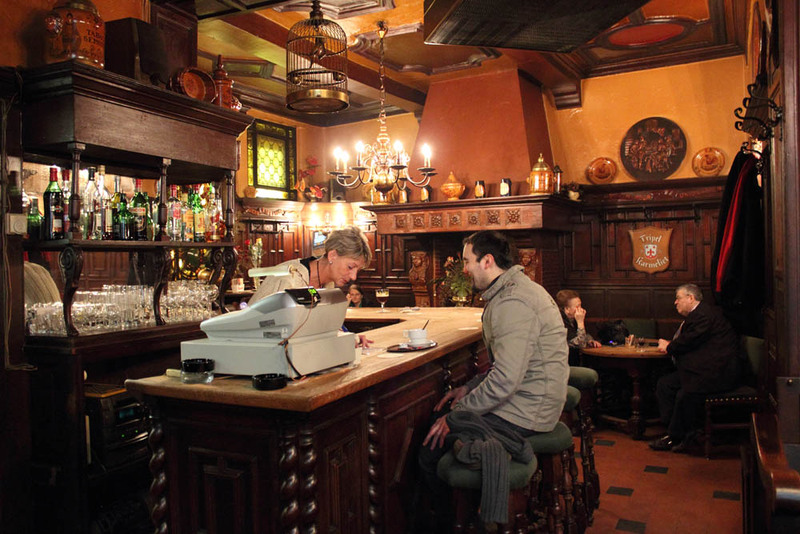 As I sat at the bar sipping my first beer in this heaven-on-Earth – a Corsendonk Blond – a wonderfully colorful woman came over and began talking to me in French. When I said I spoke very little French she effortlessly switched to English and asked if I was American. We began a conversation which soon revealed her to be the current owner of the establishment, Marie, and an invitation to sit at her table with her and her friends. I was introduced Etiennne, a judge in Brussels, and Robert, a banker. Thus began an evening of stories, drinking, and laughter that is one of my fondest memories from Brussels. In the good old days, indeed. Colorful local characters came and went as we sat and talked about American, Belgium, the state of the world, philosophy, and gutter humor. My hostess insisted I be treated as an honored guest and my other two companions proceeded to suggest beers for me to try. After several awe-inspiring beers, Marie asked if I had ever drunk a Westvleteren 12. She must have seen the look in my eyes because she immediately disappeared into the cellar behind the bar and emerged with a plain brown bottle. Channel, the bartender that evening opened the bottle, presented me with the cap, and poured the deep brown liquid into the appropriate glass. This beer is widely considered one of the best and rarest in the world. It is extraordinary Trappist quad-style beers treasured for its ability to age and deepen in flavor. In order to get this beer one has to travel to the Trappist monastery where it is brewed – by invitation only – and hope that they have some that they will sell you. Many people make the trek only to return empty-handed. Marie brought the beer to me and insisted I try it right away. I sniffed the thick head that formed at the top of the glass and smelled dark fruits – figs, plums, spices, caramel, and alcohol. The first sip was an explosion of sweet maltiness, spices, and a hint of oak. This was a truly great beer, one that I can easily say well remain burnished in my mind forever. Around 11:00 PM, Marie announced that it was a slow evening and that the pub was closing. I gathered my scarf and coat and began making my goodbyes when Etienne suggested we all go to another pub for some food and more drink. So, the night continued with my new friends. They kept ordering food and beer until the early hours of the morning. When it was finally time to leave Etienne and Robert escorted me to the Metro station, made sure I got on the correct train and told which stop to get off at. Later, as I walked through the door of my hotel, Etienne called to make sure I had made it without incident. The people of Brussels are gracious, friendly, and generous. I felt as if I were a visiting dignitary during my visit at the Au Bon Vieux Temps. My new friends Marie, Etienne, and Robert will always occupy a place in my recollection as wonderful and kind people, people who were truly and genuinely interested in me, people who were the very epitome of perfect hosts and hostesses. Corsendonk Blond — Full-bodied, blonde top-fermented beer, bubbly beer with a herbal bouquet and hoppy aftertaste. Rochefort 8 – Very dark brown with yeast visibly floating in the glass after the pour. This is a very sweet, malty beer with a slightly bitter finish. 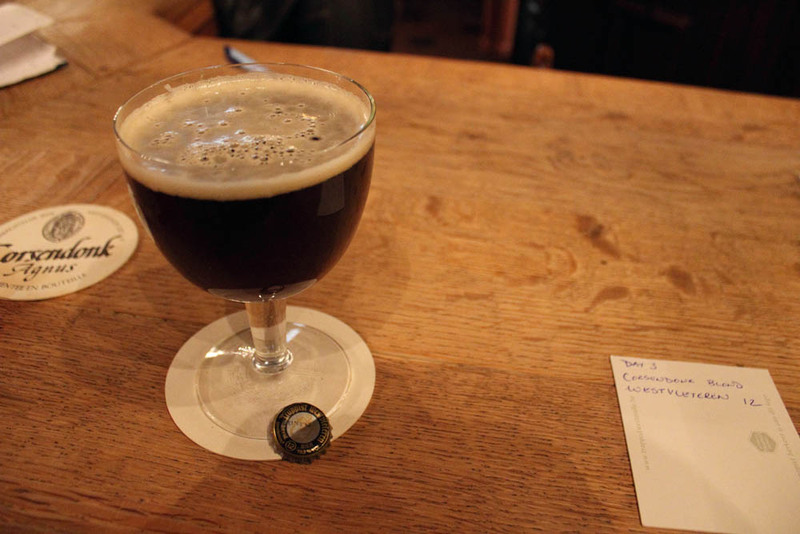 Kasteel Donker – Another dark beer, this one with a reddish tint to it. A hint of raisins and prunes on the nose reveals a sweet malty, beer with notes of the same dark fruits. Malheur — Rich, dark colored beer, with a wonderful hoppy, floral nose and well-balanced flavors, makes it easy to drink. Nuts, honey, and rum flavors from the brown candy sugar used in brewing. The aftertaste is bitter-sweet, long and warm.